1 Job Posting. Syndicated on 500+ Sites. Tired of individually posting your job opening on endless job boards? 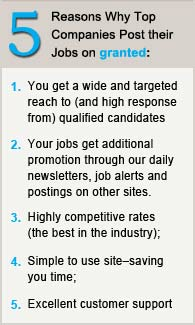 Post your job on 500+ job sites instantly and get the same exposure for a fraction of the cost and time. Access, make changes, and easily manage multiple job listings from one interface.